On the planet Cicero Prime, the kingdom of Cardenas finds itself divided by the estrangement of its Duke and Duchess by the time of their first wedding anniversary. With a line quite literally delineating the territory and supporters of one from those of the others, it has become clear to those in power that public perception and one carefully crafted murder could reap tremendous rewards while alleviating the tedium and unease of their current marital situation. 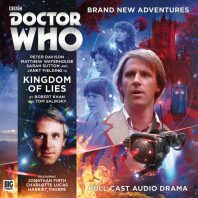 Following a thump from a frustrated Tegan, the TARDIS brings the Fifth Doctor, Nyssa, Adric, and Tegan to this fraught locale as the court and marital intrigue boils over into assassination attempts and promises of war. Big Finish has previously found tremendous success with showcasing a darker side to the mild-mannered nature of Peter Davison’s Fifth Doctor and Sarah Sutton’s Nyssa, respectively, and a case of mistaken identity in which the Duke assumes these two to be the assassin he hired to kill his wife, the Scorpion, and his apprentice allows these elements to come to the forefront once more. Of course, as they are only acting in order to save their lives, the Doctor is understandably nervous and warily cautious about just how far to proceed with this façade despite his presumed identity, setting up precautionary backups to ensure that his seemingly murderous attempts fail no matter what complications may arise. Nyssa, on the other hand, adopts her disguise as the Destroyer with gusto, confidently proclaiming their skills and ensuring the Duke does not lose faith in them, and this rarely-explored territory for the characters is delivered with conviction and aplomb by both. With Tegan and Adric taken captive by the Duchess’s side, their storyline takes a satisfyingly convergent path as Adric proclaims that they are members of the Grand Order of Alzarius sent to assassinate the Scorpion, the upcoming assassination attempt being an open secret and thus quickly earning them a spot inside the Duchess’s Royal Protection Society. Interestingly, ‘Kingdom of Lies’ manages to keep a fairly light-hearted tone despite the intrigue, misdirection, and action that abound within it. Jonathan Firth as Duke Sebastian and Charlotte Lucas as Duchess Miranda have a great chemistry when together even as their characters’ apparent revulsion for each other is all too clear; truly, the ideas the former has as visions of a successful murder intoxicate him paired with the ideas the latter has to spin the failed assassination attempt to her own advantage in the public’s eye are gloriously conceited and show just how egotistical and self-centred both of these individuals have become. Unexpectedly, though, fact follows fiction after a surprising second assassination failure as instrumented by the Doctor, and following the Duchess’s father’s promise to bring war upon Cardenas when he believes his daughter to be dead, the arrival of the true Scorpion results in all pretenses and false identities being dropped, allowing the Doctor to convince both sides to talk in neutral territory with the hope of crafting a noble and everlasting union to be forever remembered in the history books. The arrival of the Scorpion does undeniably take away from some of the roguish liveliness that pervades so much of the first three episodes, but the commitment of the assassin to fulfilling the contract at hand certainly ratchets up the tension. With a third party acting within the palace as well to take advantage of the rulers’ mutual hatred, the scope of the treachery comes into focus quite quickly, but the final episode succeeds as much as it does solely because of the characterisation of the Doctor when all cards are laid on the table. This incarnation is unquestionably one of the most compassionate and optimistic, especially in his earlier adventures, and having the killer he pretended to be stare him down and taunt his inability to carry through on his threats is riveting. Likewise, though he unquestionably will not forgive for past sins and atrocities, the fact that he absolutely refuses to be responsible for the taking of even one life is perfectly in character and actually results in him taking a surprisingly active stance in this world like would become more common as his adventures originally continued on screen. ‘Kingdom of Lies’ doesn’t necessarily innovate with its storytelling conventions, but writers Robert Khan and Tom Salinsky tell the light but ultimately very emotional tale of duplicity with extreme confidence, culminating a bit overly complexly but wholly satisfyingly with the Duke and Duchess reaching a deeper level of understanding and respect than ever before. With many layers and well-paced revelations and misdirections that keep the plot from ever becoming tedious, director Barnaby Edwards keeps the actions moving at a quick pace, and the sound design helps Cardenas come to life as an engaging locale that begins Big Finish’s 2018 Doctor Who output on a definite high.